Students are producing more projects than ever before. The proliferation of visual apps and the access to easy tech tools have allowed learners to create all sorts of digital stories and custom graphics. Yet, as Marvel Comics teaches us, with great power comes great responsibility. It is tempting to assume that because children are growing up in a visual world, they automatically know how to decode and encode optical inputs. This proficiency is known as graphicacy, which is the key to visual thinking in a differentiated classroom. If educators are going to ask students to design posters and slideshows, then they also need to guide young learners in the skills of effective design. Any teacher who has seen children layer neon pink fonts on top of vertiginous purple backgrounds knows that kids don't innately grasp the keys to clean layouts. The logo design firm DesignMantic has published a series of extremely helpful infographics to help budding artists generate successful visuals. Even though these placards are intended for marketing and business purposes, they perfectly suit the needs of teachers looking for classroom resources. 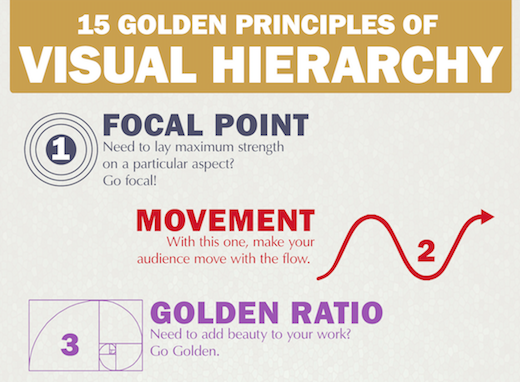 "Visual hierarchy ... offers to your eyes visual assistance, suggesting to them, what information to linger on to, as your vision glides through it. It lays down a path for the data to flow in, to get absorbed into the brain smoothly. It guides the human eye from one element of the data to the next, like an invisible pointer moving through the data, to keep the reader free of any visual fatigue." 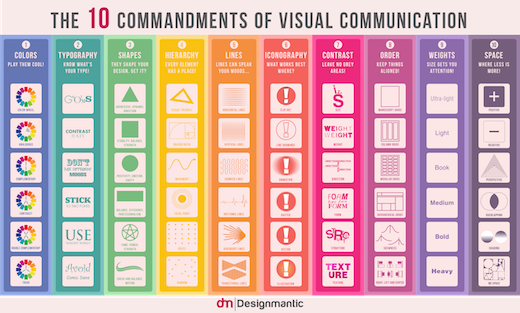 The company also offers a primer in "The 10 Commandments Of Visual Communication." Much like its tenets for quality logos, these guidelines range from line and font choices to arrangement and sizing tips. In essence, it provides "a layperson’s handbook of visual communication." It reminds us of similar advice from "The Design Of Project-Based Learning - Color Theory For Web 3.0." 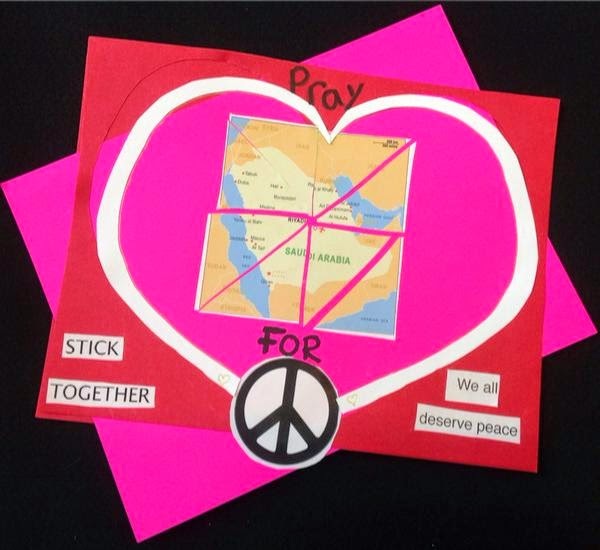 It wasn’t until our students started making heart-shaped worlds as part of a way to promote peace that we wondered if there were any historical references. To our surprise, there were plenty. 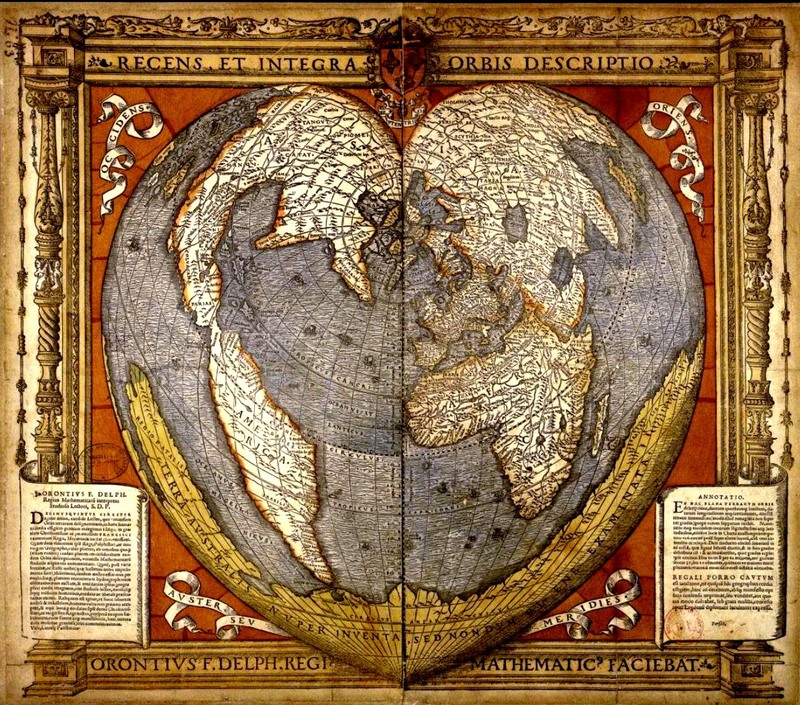 One of the earliest heart-shaped (cordiform) map projections by Oronce Fine, a French mathematician and cartographer, was created in the sixteenth century. According to Wikipedia, this might have been his most famous illustration and one that influenced other cartographers, such as Peter Apian and Gerardus Mercator. We love when something our learners do triggers a curiosity in us. Instead of showing our students the many infographics we’ve collected about Valentine’s Day that tabulate the amount of money spent by men and women on items such as flowers, chocolate, and jewelry, we chose to show these beautiful heart-shaped maps that so wholly connected to their designs. As expected, our students delighted in seeing the connection to their creations, especially since they had no idea of their connections to history. 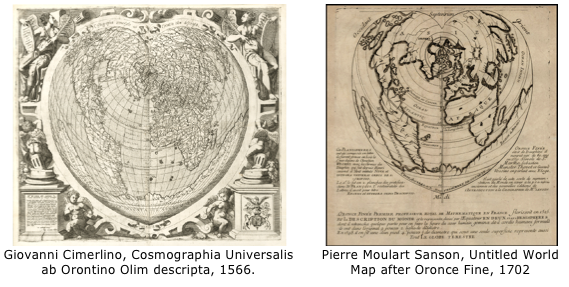 We uncovered other examples of cordiform map projections that obviously take their influence from Oronce Fine's beautiful cartographic design. The maps below, illustrated by Giovanni Cimerlino and Pierre Moulart Sanson, were done more than a century apart. Two more recent uses of the heart-shaped map appeared on stamps issued in the United States (1991) and Venezuela (1972). We wonder if the graphic artists knew of Oronce Fine's hand-drawn map of 1531. The "Love" stamp from the United States does not necessarily represent a cordiform projection, whereas the stamp from Venezuela celebrating World Health Day more closely resembles the heart-shaped designs from the fifteenth century. 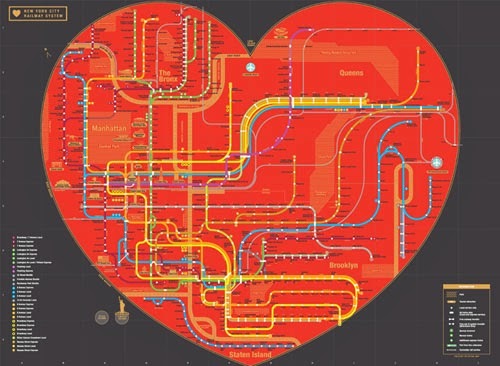 As we probed the Internet for other examples, we discovered a heart-shaped map of Seattle from 1905 and one of the New York City subway system from 2008. These maps clearly illustrate the change in design from one era to another. 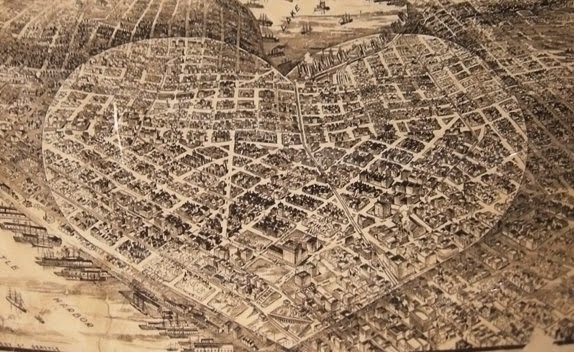 The map of Seattle represents a more typical illustration at the turn of the twentieth century, whereas the subway map, completed more than a century later, closely follows the style of a modern visual illustration or infographic. Sometimes it's the innocence of children that triggers inquiry in adults. We attribute our curiosity to them. Finding other models based on their creativity led to the discovery of historical references. Connecting history through primary sources reinforced their global view of the world. With the continued onslaught of violence and terrorism in the news, we could all use a little more heart. Logos are short-hand, visual cues that companies use to evoke their brands. Effective logos represent automatic associations between a corporation and a customer. They connect a unique icon with an emotional reaction. This type of tidy pictorial design can also be employed to winning effect in the classroom. Students can use logos to study visual metaphors and symbolic meanings. They can experiment with thesis and synthesis, in boiling down a range of meanings into a concise, original image. History students, for example, can sketch logos to embody specific presidents or time periods. We had our U.S. history classes brainstorm logos for the era of the Great Depression. The designs featured in this post range from a juxtaposition of the Empire State Building going up while the stock market goes down, to a financial Dust Bowl of lost dollars. In studying literature, learners can similarly design logos to accompany a book or a character. It's no surprise that the Hunger Games mockingjay pin became so popular among fans. Science students can draft logos for key principles or elements, or global thinkers can draw emblems to capture current events. By translating their understanding into self-created icons, students can climb a level in their comprehension, from decoding to encoding. They can capture the essential significance or recurring tropes via clever designs that will in turn help educate their peers. Begin by having learners identify logos and brands from current media. We use these sheets of letters and symbols as games to get students excited and to introduce the range of possibilities. Invite students to rank their favorite logos and explain why some stand out in their minds. 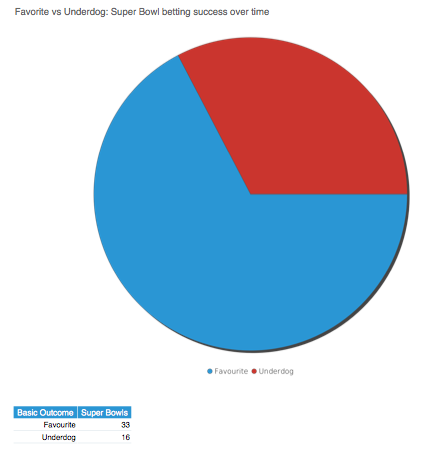 For example, we had children rate the logos of presidential candidates in 2012. Introduce some tips for contemporary design. DesignMantic has a helpful infographic of the "10 Commandments Of Logo Design." 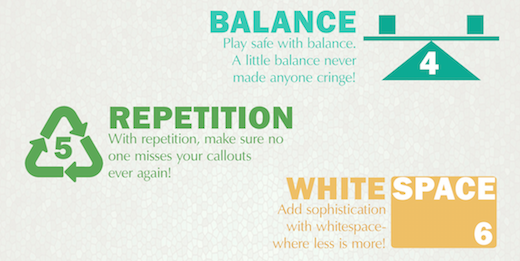 FastPrint also offers a terrific infographic about "How To Design The Perfect Logo." Ask them to brainstorm the key characters, themes, or takeaways that they would want a logo to evoke. Finally, give them a range of tools to use, from hands-on pen and paper to visual apps like Pencil by FiftyThree. Above all, a logo should present a clear, somewhat unexpected relationship between picture and subject. The video below, "49 Years Of Super Bowl Logos," reveals how images can evolve with the times to add layers of significance. With the increasing questions we received from our sixth graders about the abhorrent news this past week, we realized they needed to do something to make them feel they were sending a positive message to help the world be a more peaceful place. Eleven- and twelve-year-olds hear the news, and most have far more access to content than their parents realize. Their questions abound and need an outlet. As middle school educators, we know this. So with our friend and colleague, Francine Wisnewski (@fwisnewski), we decided to bring hearts and minds together to let the kids create a message to share on social media and with the school community. 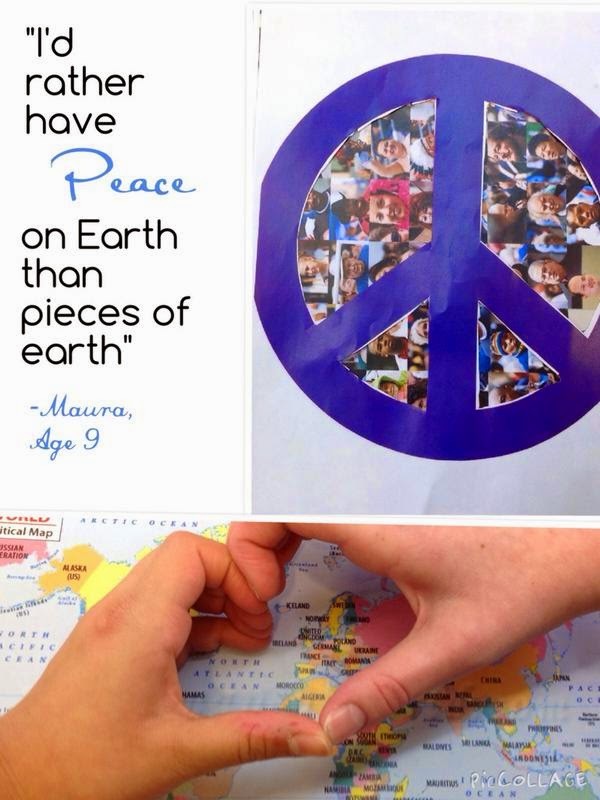 We asked them that each finished design somehow include a heart, map, and peace sign. That’s it. How they incorporated the criteria and with whom they worked, or not, was up to them. We cherish the flexibility in our curricula that allows us to stop everything to promote mindfulness with our learners. It does not matter that the schedule listed math and history; we pulled the kids together to address their concerns about world conflict and violence. We continually try to build the hearts and minds of our young learners to be peace builders, peacemakers, and peacekeepers. As adults, we understand the turmoil in the world, and sometimes we just have to stop to help them cope. It’s worth every minute. If we don’t, we lose the power of positive thinking that the world so much needs. 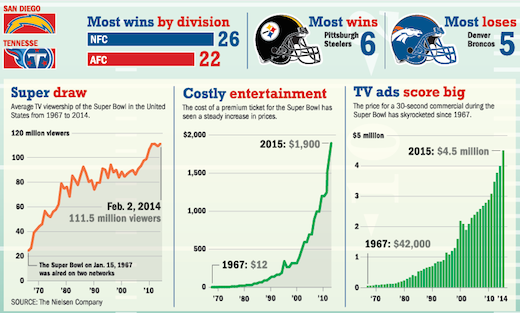 Aside from the physical drama and the halftime theatrics, the Super Bowl provides prime fodder for data analytics. The enormous volume of communication and marketing around this shared cultural moment offers a case study for exploring numbers and significance. These days, graphs are no longer the sole purview of math class. This fall, for example, we spent a “math week” in social studies talking about how historians incorporate statistics and charts in probing the details behind pivotal events. Similarly, the Super Bowl bridges academic disciplines as an appealing touchstone for students to get excited about analytical reasoning and data design. That’s how right-brained and left-brained mindsets can merge perfectly in a contemporary STEAM study. On Super Bowl Sunday, 1.25 billion chicken wings are expected to be consumed. The number of tweets is predicted to top 25 million, up significantly from the 13.4 million last year. And the average American is projected to consume 2,400 calories of Super Bowl chow. The emphasis here is on the visual presentation of numerical sets. Graphic literacy (or “graphicacy”) means that learners can “read” the grammar of lines and bars. Understanding trends and anomalies are key skills in interpreting mathematical and scientific figures. 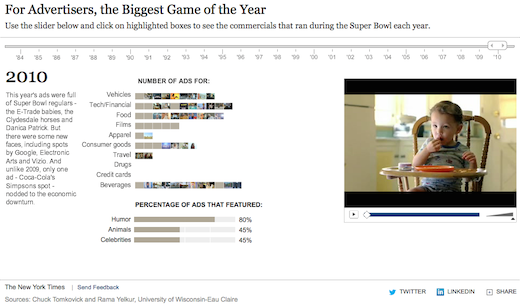 Super Bowl ads often get the most attention from both football diehards and passing revelers alike. This interactive tool from the New York Times allows students to compare a timeline of percentages as they parse the media blitz across the years. The media literacy component of Super Bowl mayhem cannot be overlooked. Many avenues exist for teachers to guide students in realizing the emotional tug of advertising during this high profile event. 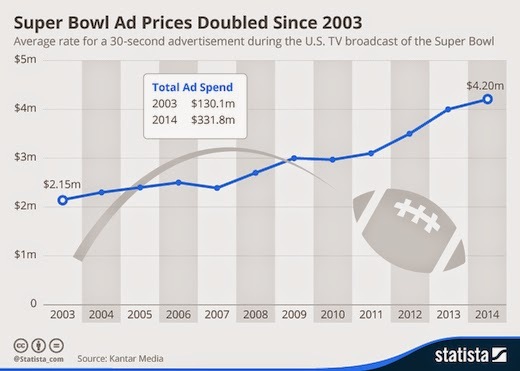 Yellowfin has designed an easily understood graph of Super Bowl ad prices to engage any student. 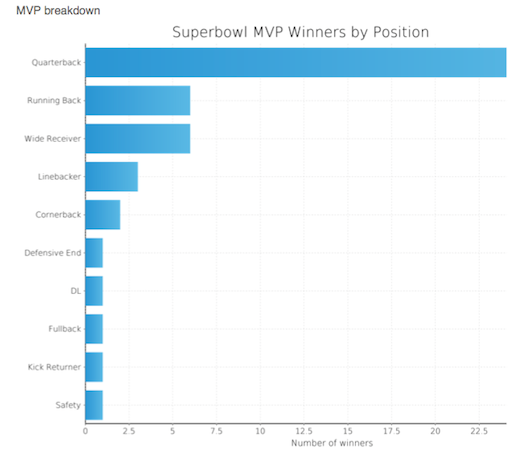 For aficionados of the sport itself, Yellowfin has assembled a horizontal bar chart of MVP winners by position. The results are familiar enough to let the content drive the comprehension. In other words, even the youngest mathematicians can expect QBs to win awards, and thus the extended blue bar becomes a visual signifier for their predictions. 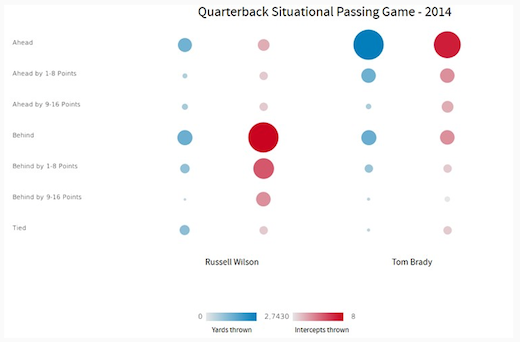 For strategists of team offenses, bubble graphs can blend with traditional tables to illuminate the choices of quarterbacks in certain situations.